The most common photographs that people have seen with this effect are wedding photographs. It almost brings home the lyrics, I only have eyes for you. It can be a very beautiful and moving effect on photos. Most people looking for that special wedding photography will request that this type of lens be used, if they are familiar at all with photography. Typically, when using the Lensbaby, the subject must already be in place, and not moving. This lens can be very challenging when trying to move objects or take spontaneous photographs. The composer does not have the capability of zooming in on an object. If the framing is not quite right, the photographer will need to move the camera closer or farther away from his subject, in order to zoom in on the perfect shot. When using this lens, it is much easier to shoot an inanimate object or a posed subject, such as a portrait or in wedding photography shots. It is perfect for that special photo, no photographer wants to miss. The composer is somewhat difficult to use in that its neck is creaky and the flexible lens needs to be moved constantly to focus on the subject. The lens does not have to be held in place, it does quite well by itself. However, when adjusting the lens, it is pretty difficult to apply just the right pressure to avoid missing the mark. With patience and time, however, it is a great lens to use for that special photo. 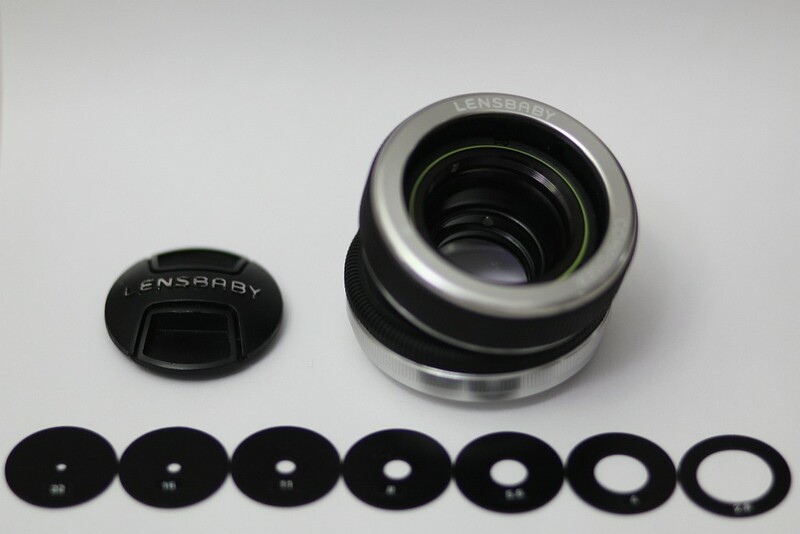 The Composer comes with a wide variety of apertures from 2.8 to 22, that all need to be manually inserted into the lens. Lensbaby made this easier by providing a magnetic wand and storage device that allows you to swap out one aperture for another, and store the remaining. One of the downsides of the composer, is that it does not allow for the use of auto light metering or autofocus on the camera, forcing the photographer to set everything manually. Some photographers do not like to use this lens, because of these limitations. In photo taking, the higher the aperture, the more subtle the effect is. Lower apertures have a much more noticeable effect because the focus is much more narrow and the blur is greater. On these particular lenses, the aperture is fixed. The higher the aperture, the less light will appear through the viewfinder. For example, an aperture of eight is darker through the viewfinder then say an aperture of two. With an aperture of 22, it is difficult to tell if the subject is in focus, because it is so dark. With other lenses, this is typically not a problem, as the other lenses compensate for the higher apertures, by keeping the aperture wide until the subject has been shot. The viewfinder is always able to let enough light in to be able to see the subject of the photograph. With the fixed apertures of Lensbaby, it is very difficult to focus on the subject at hand. The most attractive feature of the Lensbaby is the ability it has to blur subjects that are in the same field as other subjects in the same photo. It focuses its attention solely on the subject and gives a feeling of motion in a photograph that is still and not moving at all. It is really quite amazing what a simple lens can do to alter the appearance of a photograph. If used with the utmost patience, this lens is a great addition to the lenses of professional photographers, as it adds that special touch to certain pictures, such as portraits. Most photographers say it is a must have for their collection of lenses. Most photographers say that the Composer is very light and very small, allowing for the very easy carrying ability it has for photographers to simply carry in their bag for those creative shots that are great shots to get. Imagine the beauty this lens would create in particular nature shots. Besides the Composer, Lensbaby also produces the Control Freak and the Muse. Both will give the same blurring result, but the Control Freak allows for more control by the photographer. The Muse is by far the lowest cost, and is considered looser and faster. The cost of a Composer runs around $270 and has a large variety of accessories that can be added. Understanding Polarizer Lens Filter: What is a polarizer good for after all?